These are the 14 men who spent 16 days in voluntary exile on Marion Island in order to "hold the fort" until relief ships could bring permanent occupiers. "HEARTY congratulations! Now consolidate 'William' similarly as soon as you can, too." This radio message from General Headquarters at Pretoria, picked up by the Transvaal on the morning after the landing, further encouraged the ship's complement. Before dark the previous evening the frigate had hoisted anchor and shifted closer inshore, where in 27 fathoms she was less exposed to wind and sea. There had been snowstorms during the night. Throughout the hours of darkness a special watch had been kept on every whim of the wind, for the last thing Fairbairn wanted to risk was being caught by a change in wind direction against a lee shore. sinking. They saved the dinghies from being smashed to pieces against the rocks. While the ferrying operations were in progress, Anderson, Broadhurst and King were put ashore to carry out their investigations. At the same time the cairn supporting the temporary flagstaff was consolidated, so that the flag would be able to withstand tbe storms that so frequently lashed the island. approach even the lee side of the island. Before lunch Fairbairn gave up hope of an improvement that day, and ran down to the south-east of Marion. Late in the afternoon a radio message from General Headquarters was intercepted instructing Fairbairn to call for volunteers to occupy Marion island after the Transvaal sailed. It should include at least one S.A.N.F. officer with knowledge of navigation and surf conditions, and Captain Anderson. They should be given supplies to last for at least two months. When the invitation for volunteers was issued, no less than 93 per cent. of the ship's company responded - so firmly had they been gripped by the spirit of this venture. Fairbairn decided to give preference to single men, and selected his second-in-command, Lieutenant Grindley, and Sub-Lieutenant A. C. McMurray, and ten others. 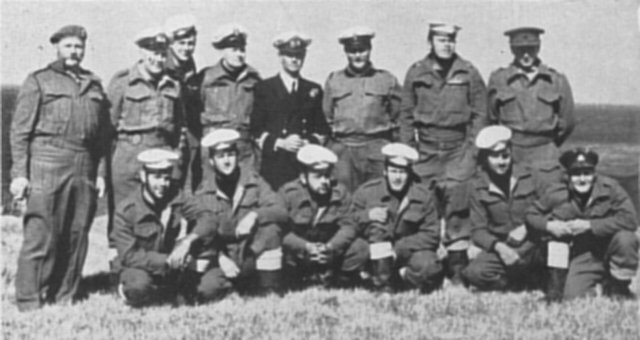 These were Petty Officer Steward Schott, Petty Officer (Sick Bay Assistant) H. G. Sorensen, Leading Seaman I. J. Mare, Able Seaman (Wireman) A. F. Rentzke, Able Seamen E. G. Layton-McCann, B. H. Lewis, J. G. Bold and J. R. Stander; and Ordinary Seaman N. L. Erasmus and Stoker T. F. van Niekerk. Lieutenant Grindley was to be in charge of the party, with Captain Anderson as his second-in-command. Grindley was known as a resourceful and painstaking officer, with remarkable doggedness of spirit. Less than nine months previously he had been lying in hospital with a double fracture of the spine as a result of a motor accident. He had spent four-and-a-half months in plaster of paris from his neck down to his thighs. The doctors had feared then that he would be an invalid for the rest of his life, but his recovery had been so rapid and complete that he was now willing, and judged fit enough, to lead his party of pioneers who would be promised only privation, hardship and danger during their voluntary exile upon the island. Year in, patrolling back and forth along the "Old Kent Road", as this much-worn pathway had already been named by some wit. Early on New Year's Day the ship returned to the islands but found conditions still too bad for landing. Fairbairn then decided to attempt a reconnaissance of Prince Edward Island by circling it anti-clockwise, starting on the south-east side. Once clear of the lee of Marion, however, he was brought up completely by the turbulence of the sea and the fury of the wind channelled between the two islands. Huge swells, averaging about 30 feet from trough to crest, swept through this channel from the north-west, and made it dangerous for the frigate to attempt the crossing. In turning about she made several stupendous rolls and everything in the ship that was not securely lashed was hurled from side to side. The hazardous operation was successfully carried out, but large quantities of crockery and other breakables were smashed. The ship returned to the lee of Marion and steamed back and forth, awaiting a possible improvement in the weather and the state of the sea. During the afternoon this came about and the frigate was able to anchor again in the cove. The swell was still too high, however, for a landing to be attempted. At three o'clock the next morning it looked as if landing might be possible, and the boats were put over the side. The whaler was re-moored at her buoy, and preparations for resuming the landing of supplies were complete when the weather once again changed for the worse. Heavy swells began to set into the anchorage, making boat work impossible, and all operations had to be suspended. As she seemed in no danger the whaler was left at the buoy, so that work could be resumed at short notice if the opportunity came. with their supplies. General Poole advised Fairbairn in this message that it was of the greatest importance to him to know which island Fairbairn considered more suitable for settlement, and what the fresh water position was on both. Fairbairn replied that Marion seemed the more suitable as a landing had been made there and he had been able to authenticate reports of a previous settlement there. The water supply seemed ample. General Headquarters were now becoming concerned at the prolonged delay in landing on and annexing Prince Edward Island, and a radio message was sent to Fairbairn instructing him that if he was unable to complete his mission before he started homeward, he should leave the flag and documents intended for Prince Edward Island with the shore party on Marion. The wind, variable as usual in direction and force, demonstrated some of its capabilities during the day, when small but violent whirlwinds sucked up columns of spume and chased each other about the anchorage and out to sea. The weather did not allow landing operations to be resumed before dark, and the frigate spent the night at anchor, leaving her whaler at its buoy. There was a surprise for the Transvaal's men next day. The weather was perfect, and remained so throughout the day. From three o'clock in the morning until eight o'clock at night, the South Africans were busy ferrying stores ashore. Captain Anderson selected a site for the temporary occupation party's bivouac on top of the promontory protecting the landing beach, which had been given the name Gunner's Point after Lieutenant F. Jones, "Guns" of the warship. He and his colleagues resumed their exploration and survey of the island. The Transvaal's navigator, Lieutenant Norman Rayner, reconnoitred another landing place nearer the waterfall, which looked as if it might be of value in the future. flag properly flying on their new territory before they started homeward. Although they had been told not to hold up more urgent work for it, they found time to assemble and step the new metal flagstaff on the ridge behind the landing beach. To the accompaniment of ringing cheers from both shore and ship, the linen flag was hoisted to the masthead, where it fluttered bravely in the breeze, visible from a good distance. The coming of darkness brought the operations to a close, with all the supplies except the personal gear of the occupation party safely ashore. After 17 hours of almost non-stop work the men were glad to retire to their bunks and hammocks. As a result of the investigations and experiences of the landing parties, Fairbairn sent off a radio message asking that the next ship to come down should bring with her stocks of coal in bags, as there was no fuel on the islands; a large supply of boats' anchors, since the loss rate was heavy, and suitable demolition charges with which to clear a passage for boats through kelp. The next morning the weather continued fine, and by breakfast-time the whole occupation party, with the exception of its leader, was safely ashore. Fairbairn had decided that it would be unwise for Grindley to leave the ship until the Prince Edward Island landing had been effected. The Transvaal's Captain realised that once he was ashore there was always the risk of finding himself marooned there by bad weather, and it would be wise to have his deputy standing by aboard the ship to take command in such an eventuality. For this reason he had seen to it that he and his second-in-command were never away from the ship at the same time. weighed at eleven-thirty and the Transvaal began the 13-mile passage to the other island. By the time she reached the channel between them fog had come down, and she had to proceed slowly and carefully. She was comparatively close to the island before she sighted it. She was again hampered in her approach by the fact that her echo-sounder and deep-sea sounding machine were giving unreliable readings because of the carpet of kelp beneath the ship. A quick reconnaissance showed that the cove opposite the cave on the eastern side of the island offered the best landing conditions at the moment. The frigate therefore headed in this direction. She went in slowly and carefully, taking frequent soundings with her hand-lead. This consistently showed deep water until suddenly a sounding of 16 fathoms only was obtained. The water happened to be remarkably clear, and looking over the side it was possible to see masses of kelp extending down a great distance towards the sea floor. Fearing danger, Fairbairn turned his ship seaward again and made another approach from a different direction. This time he came to anchor in 45 fathoms, three-and-a-half cables (just under half a mile) from the shore. The deep-sea lead showed that within the space of one cable (600 feet) from this position shorewards, the water shoaled rapidly to 15 fathoms, indicating a subterranean shelf. It was by now nearly mid-afternoon, so no time was lost in lowering the motor-boat and sending it shoreward with Grindley to reconnoitre. In less than ten minutes he was back with a favourable report of the landing possibilities. Fairbairn wasted no time in boarding one of the dinghies with his metal flag, the brass plate bearing the ship's name and that of the island, together with the date, hurriedly punched on it, and the Deed of Sovereignty with its metal container. There was room for only two others to man the dinghy, and Petty Officer Sadler and Leading Seaman Firmani were selected. The motor-boat towed the dinghy to the kelp barrier, which was safely negotiated after some effort. A heavy surf was breaking on the beach, which, like that at Marion, was composed entirely of rounded boulders. It was too dangerous for the dinghy to close the rocks, so Fairbairn, grasping his flagstaff, name-plate and a camera, awaited his chance and jumped into shallow water as a wave receded. The clarity of the water, however, had deceived him. He had thought it was only about two feet deep, but he went in up to his neck. He waded ashore and emerged from the sea with his uniform, immaculate a moment before, now sodden and gleaming like the coats of the sea-elephants lying somnolently around. The frigate Captain clambered over the rocks to higher ground out of range of the surf, there to conduct, all by himself, a solemn ceremony claiming sovereignty over this desolate territory for the Union of South Africa. He repeated his performance at Marion, but this time entirely on his own, because the crew of the dinghy were fully engaged struggling to keep their tiny craft from being overturned by the surf or shattered against the rocks. Fairbairn, however, read aloud the Deed of Sovereignty to its end, then signed it and inserted it in its canister and lashed this to the base of the metal flagstaff that he had thrust into a bank of peaty soil. He had gone to some trouble to find an elevated position not easily accessible to the sea-elephants, for he feared their curiosity and clumsiness might otherwise soon efface this visual evidence of his country's sovereignty. For the same reason he piled the heaviest boulders he could handle upon the name-plate that he deposited at the base of the flagpole. poor that he doubted if much would be identifiable in his two exposures. South Arica acquired Prince Edward Island by perhaps one of the least ceremonial annexation ceremonies in history. Fairbairn waded out of the sea on to it at 3.50 p.m. on Sunday, January 4, 1948. He planted the flag at 3.54 p.m. He waded back into the sea at 4.11 p.m., was dragged aboard the dinghy, and a few minutes later was having a quick washdown and a change of clothes in his comfortable cabin aboard the frigate.